There has rarely been a time when innovation has been more important for businesses. Today’s challenging economic conditions allied with global competition provide a business landscape that is hostile to companies that stand still. The dramatic and seemingly incessant development of technologies – particularly those allied to the internet – provide opportunities for new products, new services and indeed new ways of doing business. And lastly, today’s market is truly global, offering an unparalleled opportunity for businesses. For businesses to survive, let alone grow, they must be effective at innovation – at converting ideas to products and services in the market that deliver value to users and income to their creators. 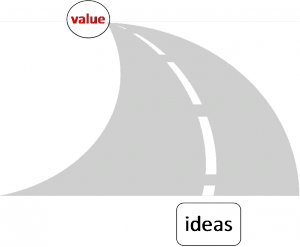 The journey from ideas to value is not a simple one. There are many steps along the way and many opportunities for good ideas to be lost, poor ideas to reach the market or for the journey itself to take longer than it really should. 1.Overall our study found significant correlation between innovation journey practices and ultimate innovation performance (see scatter chart below). This showed that improving practices across the nine steps of the innovation journey will result in improved innovation performance. To further enhance innovation performance, businesses need to address the other innovation practices in areas such as Leadership and Culture. 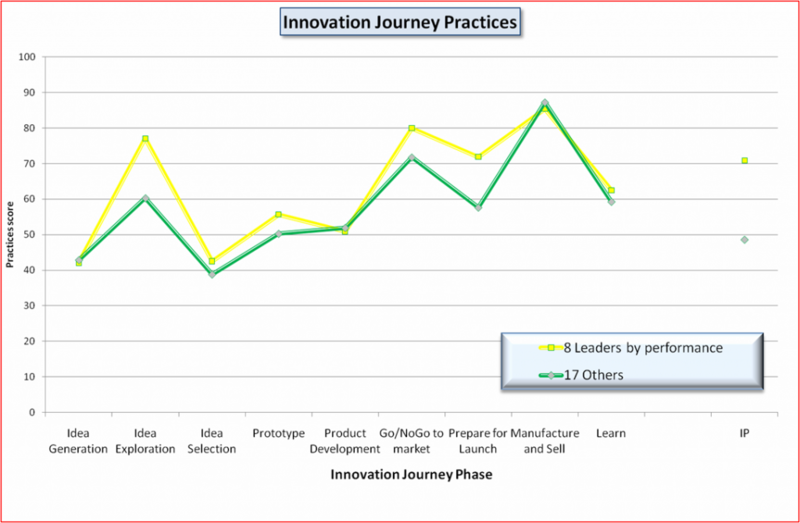 2.The biggest gaps between Innovation Leaders and the others, in innovation journey practices were in Idea Exploration, Market/Launch Preparation and in IP Strategy & Management (see chart above that maps innovation practice scoring across the 9 steps of the innovation journey). This suggests that these three areas are the most critical in determining innovation success. 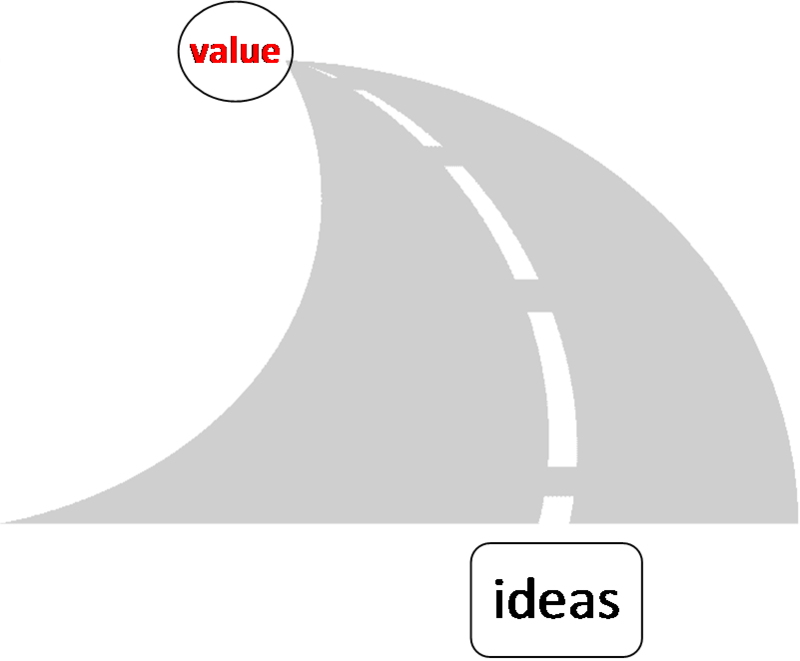 It is interesting to note that Idea Exploration and Market Preparation are at opposite ends of the innovation journey – one determining the quality of the new ideas that go into the ‘innovation pipe’ and the other preparing the market resources and partners for new product exiting the ‘innovation pipe’. This is an issue for many businesses whose existing New Product Development processes rarely cover these key front and back-end activities. 3.Leaders had a noticeably higher level of user focus across the innovation journey than did other companies and we would conclude that this is a key enabler to their higher innovation performance. 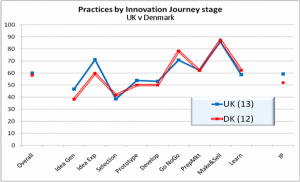 4.In contrast, practice areas that might have been expected to have high importance – such as Product Development – show little difference in practice between Innovation Leaders and the others. 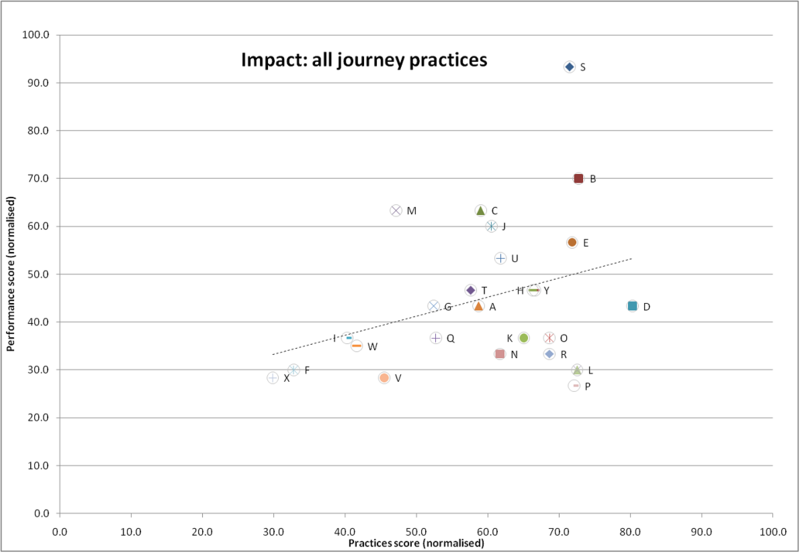 5.When we examined the individual lower level practices that together comprised the nine individual steps through the innovation journey and their level of individual correlation with overall innovation performance, Intellectual Property (IP) management practices had the highest correlation with overall innovation performance. We believe that this is as much an outcome of being an effective innovator as an enabler to becoming an effective innovator. 6.Overall, there was generally little overall difference between the UK and Danish participants, (see chart above) other than in Idea Exploration and in IP Strategy and Management, where the UK companies were a little further ahead. There were more differences at the detail level with different priorities in areas such as Learning and IP Management. 7.The study also confirmed that those companies practicing significant Open Innovation today were more likely to have higher innovation performance than those who were not. 8.The study sample was too small to enable valid comparisons between individual business attributes such as sectors and size. We hope to address this by expanding the database with further participants. In the detailed study report provided to participating companies, we identified key learning points from this study and made recommendations for businesses who are seeking to improve their effectiveness in their own ‘innovation journeys’. Participating companies were also provided with their performance score against the other participants – on an anonymous basis. We propose to extend this work by growing the sample of companies assessed against this model, through use of the model in consulting work and in research to help businesses improve their innovation performance. For more information on the study, on how to have your company assessed against the innovation journey model or to request a copy of the complete report, please contact us via www.codexx.com. You are currently browsing the Codexx blog archives for March, 2011.